Organizing your own tech conference How cool is that?! Well, pretty cool, I’d say. And even cooler if you are a young professional, fresh out of university and just started in your first job. But our pay-off is “Je kan het met bol.com” and that’s exactly how it is! The best stories start with “Once upon a borrel…” and so does this one. It was the beginning of 2017, Friday afternoon, the bar was open, the workweek washed away with drinks and the talks turned to our favorite formats: “what if…” or “why don’t we just…”, followed by something we could and should definitely do better for our customers, partners or colleagues. A group of IT young professionals discussed the great new stuff they discovered that week, and was surprised by how little they knew about each other’s projects. Hell, they knew more about other company’s cool stuff reading blogs and joining meet-ups than from what happens at bol.com! That called for a change. One of the biggest pitfalls in a growing company with lots of autonomous teams is not knowing what your colleagues are working on – and as a consequence, spending your scarce, valuable resources on the same things in different places or finding out the wheel twice. Or even more frustrating, not being able to find help when you’re stuck while ploughing through unknown territory & technology on your own. On the other hand, when you’re not aware what cool things other teams are exploring, you miss out on the opportunity to boldly go where no one’s gone before together, and on all the fun and energy that could have brought you! On that Friday afternoon they started fantasizing. “What if we would organize a conference for and by bol.com engineers, where all of us can present our pet projects, tech challenges, e-commerce dreams and ideas-worth-spreading? Just like in a real tech conference, with proposals, a deadline and a program committee, keynotes, lightning talks, side tracks and an energizing host, good food, hallway tracks, stickers and of course: t-shirts! ?” It would not only help us to better understand what we’re doing and be a great opportunity to learn, it would also be a huge boost for our feeling of community, of us being one company although spread over 4 spaces & buildings. From then on there was only one option: make it happen. And that’s what they did. They formed a team, arranged budget, sped-up the redesign of our new amphitheater, called for papers, plugged their vision everywhere they could. And on June 9th, 2017 they launched Spaces Summit, a conference by engineers, for engineers. And it was all that they had dreamed up and more: a day of sparks, sharing our vision and passion, and above all being proud of our awesome IT community & friends. So this year, we did it again. 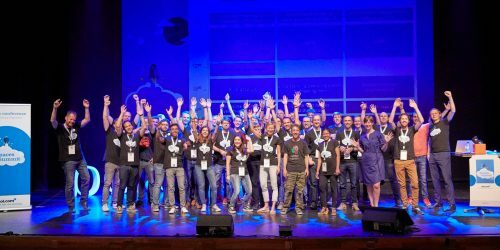 Spaces Summit – the even better edition, took place on June 7th and it was indeed even better than the first one. We went back to our roots in Nieuwegein, where we filled a theater for a full day. With awesome talks about technology and ways-of-working, 300+ enthusiastic colleagues, friends from our sister ah.nl and from universities, sketch note professionals & amateurs, a poster-your-team competition, sticker marketplace, Arcade & VR machines. And (again) a passionate organizing committee of newbies to the organizing-a-conference front. Important detail: even the t-shirts were better (fashionably black, what else? ), so good that our CEO wore it to a shareholder meeting afterwards.